Here is an Aschoff nodule at high magnification. The most characteristic component is the Aschoff giant cell. 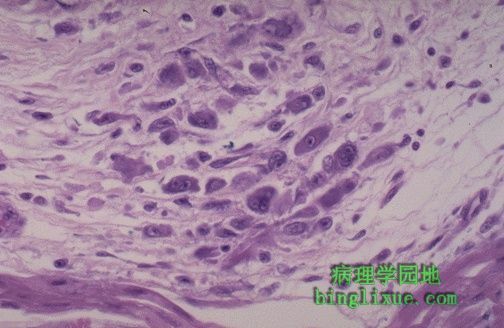 Several appear here as large cells with two or more nuclei that have prominent nucleoli. Scattered inflammatory cells accompany them and can be mononuclears or occasionally neutrophils.